Looking for yesterday’s Journey Post? Check out Worship On Purpose! 1) According to verses 1-2, what are five ways David praises God? 2) What does the phrase “with my whole heart” mean? 3) What is the main theme of the “deeds” that the Psalmist recounts in verses 3-8? What does this tell us about God? David gives thanks, recounts His deeds, is glad in Him, exults in Him, and sings praise to His name. Giving thanks, singing, and recounting the things God has done are fairly common, but what exactly does David mean by being glad and exulting in God? The word “exult” comes from a root word that means “to jump for joy,” and means “to rejoice, triumph.” Be glad just means to be glad (no hidden meaning there!). We are given the example by David of praising God by rejoicing in Him. Just as it does today, the heart represented the center of emotions to the ancient Hebrews. David praised God with his whole heart—that is, with the emotions to go along with the actions of praise. He didn’t simply go through the motions, but his inner self was involved in worship, as well. David tells of God’s righteous judgment, that He has made the wicked perish, that his enemies have stumbled in God’s presence. These describe the justice of God. Verse 8 tells us that God judges with righteousness and uprightness. God is a good judge. He always deals with evil in His time. David was speaking for his current day enemies being defeated, but his words hit at the final battle between Christ and Satan where the Enemy truly will come to an “everlasting ruin”. Satan’s destruction will be final in that last judgement where the righteousness of God will supremely reign! These five ways to praise are given to us as an example. Honestly examine your own praise of God. Do you breeze through a few things you’re thankful for or do you sit and contemplate the gracious goodness of God with David’s 5 steps? 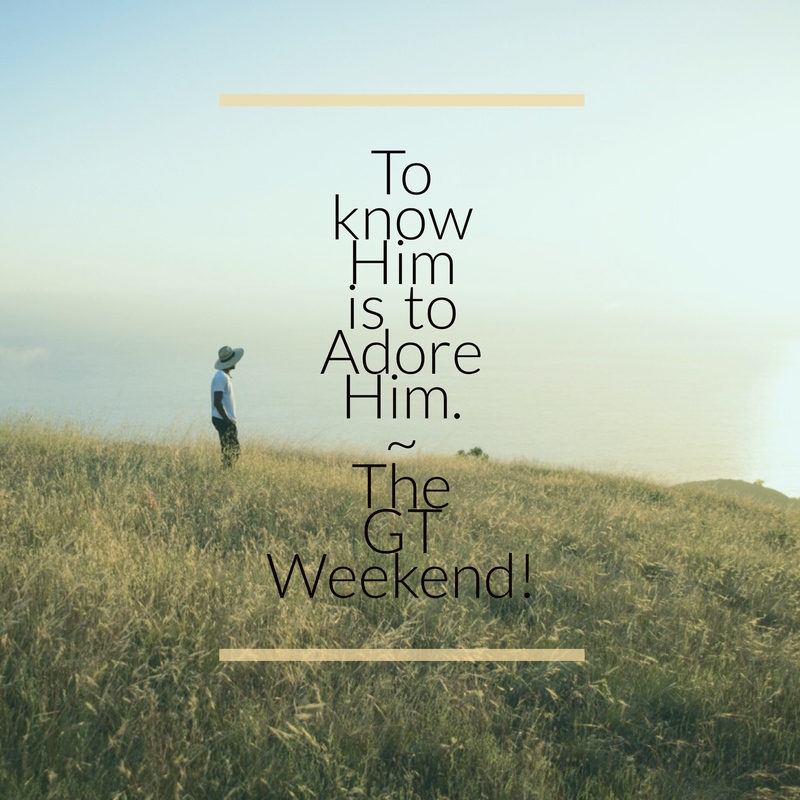 Spend some time today praising God by giving thanks, recounting His deeds, being glad in Him, rejoicing (exulting) in Him and His character, and singing praise to Him. It is all too easy for us to be caught up in the pressure of what needs to be done next. We can so easily make prayer, Bible study, church attendance, worship simply one more thing to check off our to-do list. But God wants our whole hearts! Pray and confess your sin of “going through the motions,” and think of one tangible thing you can do to prepare your heart for your next opportunity with God. While our “whole heart” includes our emotions, we don’t always “feel” like praising God, but if we truly set aside intentional time to honestly worship God, the feelings will most definitely follow. Try David’s 5 steps to get you going and see what you discover along the way! God’s justice is perfect! This is such a wonderful and terrifying truth. When we are on the right side of His justice (by being saved by grace through faith), we have nothing to fear, and we can trust that He will deal with our offenders and be a righteous judge on our behalf. But when we consider God’s justice from the perspective of the sinners that we are, a righteous judge is frightening. We deserve punishment for our sins. Praise God that He sent His Son to take our punishment, so that justice could be satisfied without destroying us! If you have not yet trusted in Christ to take away the debt of justice that you owe for your sins, please do not delay! Thanks for joining us today as we journeyed into Adoring Week Two! See all past studies in Adoring! The winter, though long and cold, was full of merriment and memories. My husband and I had finally settled into a rhythm with our new little one. Only 17 months had passed since the all-too-brief life of our firstborn, and we marveled at every moment we had with our son, Zai. We spent every minute we could with him. Playing, laughing, teaching, learning. We celebrated every first and cried at every second. We took down our Christmas decorations one night and boxed up the clothes he had already outgrown the next. Life had been difficult for a while, but it seemed like things were finally good. One night in February, we spent some time reflecting over the previous year…both highs and lows. With happy hearts, we discussed our plans for the months to come as we tucked our Tiny into his bed. I stole back downstairs to switch the laundry over and decided to finish some reading and write in my prayer journal for a little while as I waited for the cycle to end. I skimmed through the passages halfheartedly and began to write. Several sentences later, I paused and looked over what I had just written. My brow wrinkled with concern. There wasn’t anything wrong with the words…but there was a definite lack of sincerity. I had written the words only moments prior, but I couldn’t even recall them until I read over them again. As I thought about what that implied, I felt a gentle nudge in my spirit. but when your life feels easier I become just another task on your to-do list? My heart ached suddenly with conviction and remorse. Such a gentle question. Such a gentle Father. As always, He was right. I had been going through the motions, but my heart was removed from my words of praise. We can all recall moments when we have done the same. Faced with circumstances or events that knock us on our heels and take our breath away, it is all too apparent that we can’t cope on our own. Our dependence becomes painfully and beautifully obvious. Transparent and hurting, we kneel before Him, desperate for His light. We worship Him in our brokenness. 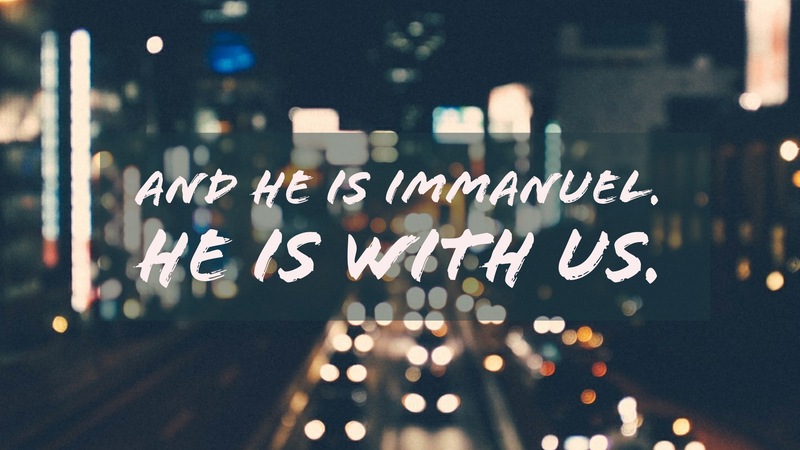 Our very spirit cries out for connection with Immanuel, God With Us. 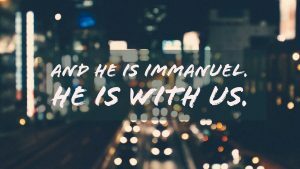 And He IS Immanuel. He is with us. But what about when our pace of life becomes easy? Relieved at our new normal, we celebrate our “change of circumstance” and jump into this new rhythm wholeheartedly. So easily, we become caught in a cycle of busy as we flit from one good thing or experience to the next. Or has it been a week? If we’re being honest, not one of us can say we haven’t been there. So…how do we change the reality of our nature? By purposing to live a life of worship. regardless of our situation, circumstance or reality. Father, thank You for Your loving correction. Thank You for loving us enough to speak to us and show us Your heart. Show me when my motives and habits begin to shift so that I can remain tuned in to You and give You the worship that only You deserve. Help me to live a life of worship in spirit and in truth. Thanks for joining us today as we journeyed into Adoring Week Two! Don’t miss out on the discussion below – we’d love to hear your thoughts! Looking for yesterday’s Journey Post? Check out When Jesus Didn’t Feel Brave! 1) What are the questions the Psalmist asks? What do these questions indicate? 2) What are the responses to those questions? 3) Verse 7 uses the metaphors of a waterfall, breakers, and waves. What do these mean? 4) What is the overall message of this psalm? “Why are you cast down, O my soul, and why are you in turmoil?” “Why have you [God] forgotten me? Why do I go mourning because of the oppression of the enemy?” Other people ask, “Where is your God?” These questions indicate that the Psalmist is experiencing some circumstances (oppression from enemies, people mocking him) that are causing him inner turmoil. He is in a tough place emotionally. Immediately after each of these questions is asked in the text, the Psalmist points back to hoping in God. He says he will again praise God, and calls Him his salvation. He says he will remember God, and speaks of His steadfast love and nearness. Anyone who has ever been in the ocean knows the power of the strong breakers and waves, how they come one after another, pushing down. Likewise, a waterfall’s unrelenting power can actually carve the rocks upon which it falls, all with a roaring sound that overwhelms the ears. This verse speaks of the depth of the troubles and afflictions of the writer—he is overwhelmed by the oppression of his circumstances. Even with the imagery that shows the depths of the trouble the Psalmist endures, he is able to point to the solution to his trouble—hope in God. 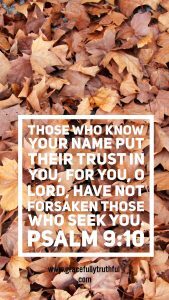 He trusts God as his salvation from these trials, and his soul is comforted by praising Him. Troubles abound in this life. There are difficult things that we go through as Christians, sometimes because of our own sin, sometimes because of the sin of others, and sometimes because of spiritual attack by the enemies of Christ. This psalm (and others) teach us that it is okay to cry out to God! He can handle our questions, and He is not threatened when we express what our souls are feeling. The Psalmist was honest with his feelings, but he was also quick to state his hope in God. He knew that God was his salvation, and he remembered Him. May we be quick to remember our Savior in our times of despair. He is the only One with the power to change our circumstances and comfort our hearts. 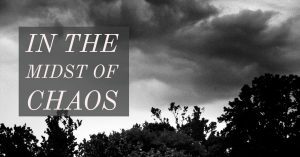 Somehow, in the midst of our troubles, it is comforting to know that people throughout history have felt overwhelmed by the circumstances in their lives that cause pain. But God is good, and He is faithful, and He cares for us. He will pluck us from the waves and hold our souls steady, even in the midst of trials. Trials and sorrows abound, but God is our Savior, worthy to be praised! Let us teach our souls to remember Him and sing His praises, even in the depths of our despair. Ask the Holy Spirit to lead your heart to Jesus, who endured much more than us so that it can be well with our souls, even in the pits of this life. Nodding and smiling, smiling and nodding. Her heels click persistently and she hooks the straps of her bag with her thumb and slings it back over her shoulder again. Kissing her baby’s forehead, she steels herself against the cries she knows will start at any moment. She waves to an acquaintance and opens the nursery door. An unearthly wail pierces the relative calm of the hallway. Smiling, she gently plucks imaginary fuzz from her smallest one’s shirt. She hugs him close for a moment as she whisper-comforts the child she has affectionately dubbed “the Screamer”. The shrill sound seems to grow louder. She winces again as she disentangles herself from swinging legs and arms and pries the infant’s fingers from her hair. “Mama will be back right after class, okay Sweetheart? Have fun! You are fine!” The little boy presses his screaming face up to the window, tears streaming as she adjusts the heavy bag and blows him a kiss before striding purposefully down the hallway, nodding and smiling to acquaintances and strangers alike. Turning the corner, she slips into a small room tucked inside a quiet hallway. A cursory glance assures her that no one else is present, so she sets her heavy purse down and rests two hands on the countertop. She takes a breath and examines the reflection before her. A pale face and slightly disheveled hair draw her attention; she sighs as her reflection reveals obviously tired eyes. The sudden serenity following a week of cacophony is almost too much contrast to bear, and tears slip silently over pale cheeks. Different circumstances perhaps, but still her. Instead of a child, it’s a sickness, or a relationship, a heart-wound, financial struggle, depression. Something that reflects a heavy spirit. I have been her. Truthfully, I might be again. Maybe tomorrow, maybe next month. Doing life is an amazing, wonderful gift. And doing life is also hard. And sometimes, our response to the constant, noisy, overwhelmingly beautiful gift of LIFE is to feel sad. Hannah experienced deep feelings of sadness, too. She loved her husband and was heartbroken over her inability to conceive. Her husband loved her and desperately wanted her to be happy, but as much as he loved her, he simply wasn’t capable of changing her circumstance or her perception. 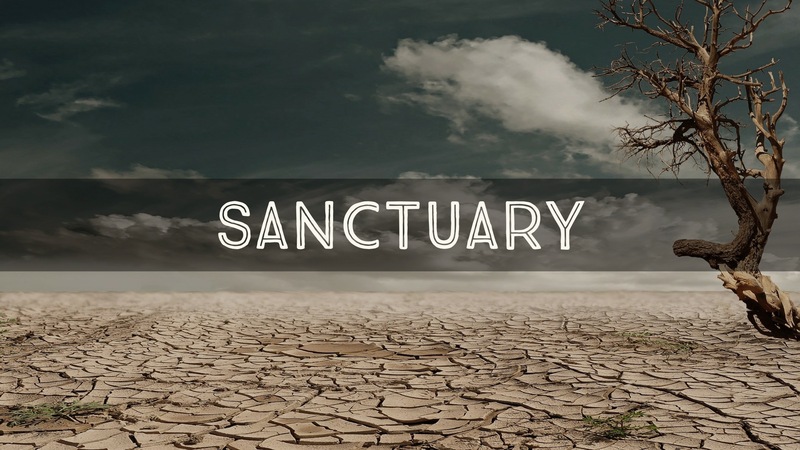 Faced with the reality of her emotion and the inability of herself or her husband to change her feelings or her circumstance, she entered into the place of worship. Rather than continue to wrestle with her feelings on her own, she entered her Father’s Presence. She responded to a conversation with Him that He had undoubtedly begun with gentle whispers in her heart. She accepted the opportunity to build relationship with Him. And He listened to her heart and changed her reality, by giving her hope. If you know Hannah’s story, you know that God gave her the desire of her heart, a baby boy. And Hannah gave that little boy right back to God. Yet she was still satisfied. because her heart was already satisfied by worship and adoration of the God who loved her. The day she brought her son to live at the temple, she first brought an offering and worshipped. Through the life focus of such adoration, she taught her son to also live a life of worship. As she left her little Samuel, who would grow up to be an incredible leader and prophet, her heart overflowed with adoration in the form of a song. Her sadness ended with a song because adoration was her heart’s focus. Each of us will inevitably experience sadness. It’s what we choose to worship when that sadness comes that makes all the difference. Will our worship be focused on our self or our Savior? Only one recipient of our adoration can bring about life transformation! 1) What are the things that vie for your attention? The things on your to-do list? The things that stress you out? It’s probably a pretty long list considering that this is the holiday season 🙂 Challenge yourself to make a list of your big stressors and for each one you list, write a truth about God’s character to dwell on when that stressor weighs on you. Involve a friend and challenge her to do the same thing! 2) Sometimes walking through one day feels like an emotional roller coaster from hour to hour, going from awesome to barely surviving. The changing tide of our circumstances can either threaten us or allow us to dig deeper into God’s character. Choose a new character trait of God’s heart each week to focus on when your surroundings feel overwhelming. 3) What have you learned about the heart of God lately? In what ways has that truth comforted you in your everyday life? Take a minute to share what you’ve been discovering with a friend! My Jesus, adoring You, like anything else in life, is a choice. When I’m tempted, Spirit remind me, to choose You. When I’m frustrated, remind me to choose You. When I reach for annoyance or anger or hurt, turn my thoughts towards You, O God! Let me see You more clearly when all I seem to want to see is my own pain. Give me a desire for You, Lord. 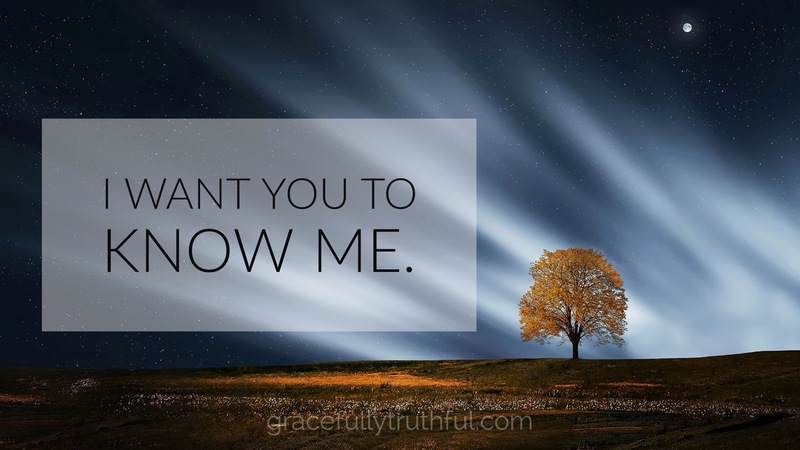 Show me my emptiness, the ungrateful areas in my heart, and reveal Your own fullness to cover me. Show me how You long to be my everything and increase in me a longing for You! Show me Yourself, Lord Jesus! I often find these questions creeping into my mind as I watch the news and scroll through social media. Some days it can feel like the earth is in complete chaos. Warring political parties, needless violence, incomprehensible racism, corrupt governments, horrific natural disasters, extreme poverty, and desperate sickness. When our eyes behold the tragedies of the world, our hope can begin to feel as if it’s fading away and darkness is taking hold. But for every moment I look at the hardships of this world, I remember my need to turn to the Word of God. Even when we feel as if sin and darkness are winning, the Lord has and is continually filling the earth with His steadfast love. His love for the world doesn’t change according to governments, political powers, or emotional highs. In an uncertain political climate, we as believers can be certain of God’s sovereignty and love for us. The psalmist declares that human leaders cannot save us and that putting our hope in them will always fail us. It is the counsel of the Lord alone that stands forever. Famine will come. Whether physically, emotionally, or spiritually, we will endure hardships in our lives. In fact, Jesus Himself promises it. On one occasion He said to His disciples, “I have said these things to you, that in me you may have peace. In the world you will have tribulation. But take heart. I have overcome the world.” (John 16:33) When we put our hope and trust in God, He is faithful to deliver us because He is bigger than the sin in our hearts and in our world. We worship the God that loves us and delivers us in the midst of chaos. but because we trust Him and He is holy. He is where our hope comes from. Here’s a link to all past studies in Adoring! 1) What response does the Psalmist say he gets when he calls upon the Lord? 2) What rhetorical question does the Psalmist ask? 3) In verses 6-9, what point is the Psalmist trying to make? 1) What response does the Psalmist say he gets when he calls upon the Lord?Sometimes there isn’t a need to look beyond what is on the page. It is written clearly and even finding the “original” intent would not give deeper insight. The Psalmist has the awareness of His God. He trusts in the solid truth that when he calls on God, the Lord will answer and set him free. The circumstances of the trial did not end, but reliance and trust in the Lord gives freedom from the distress of a situation or trial. “What can man do to me?” is asked by the Psalmist. This particular question is asked at least two other times in Scripture, in Psalm 56 and Hebrews 13. In all three contexts the question is asked in comparing God to man. If God is on our side, then what could this world and the persons of this world possibly do to me or give to me that would surpass my relationship with the Lord. The Psalmist is making a series of comparison statements between taking refuge in the Lord and trusting in the world or the rulers of the world. The writer is secure in his knowledge that God is indeed his helper and deserves full confidence because of His ability to offer refuge to those who trust Him. By the end of the Psalm, he is secure and thankful that God endures! In times of trial and tribulation God simply asks that we trust. He asks that we trust that He is able, He is present, and most important He is in control. Our faith, our trust in Lord, isn’t dependent on circumstance. 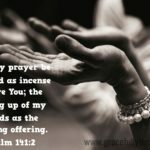 Actually, what we find here in Psalm 118 is that in the deepest of distress, the one place that we can turn is to the Lord. The Psalmist expresses his distress but is singing songs of thanksgiving because he is aware that God is able, good, and steadfast despite the distress. 2) What significance does the rhetorical question have for my life? The world we live in would like us to believe that it has the best and brightest options for whatever we need. If it is peace, it can give it. If we are looking for money, they have it. If we need a fix of just about anything, the world is ready and willing to help us out. The problem is that nothing the world has to offer is of eternal value. 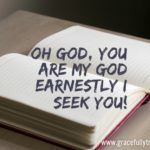 As believers, God desires us to follow Him first and foremost and when we do that, giving ourselves fully in pursuit of Him, the perishable things of this world are no match for the imperishable inheritance found in Christ. 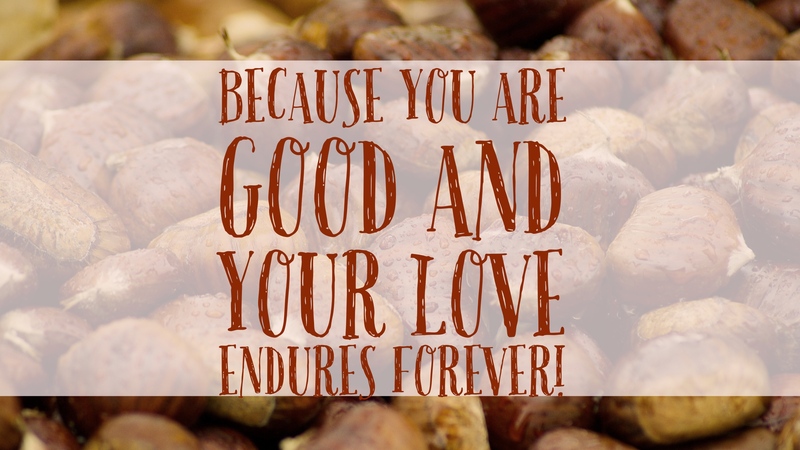 We can be thankful in the midst of trial and tribulation, joy and sorrow because we serve a God that his steadfast love endures forever and circumstances don’t change that! Thanks for joining us today as we journeyed into Adoring Week One! Looking for yesterday’s Journey Post? Check out Behind The Worship! 1) Who are Ephraim and Judah? 2) What does the imagery about a cloud and dew tell us about their love? 3) What is the result of their lack of love? 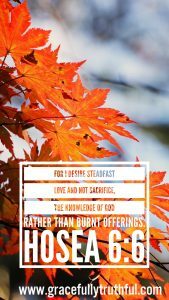 4) What do sacrifice and burnt offerings have to do with the judgment of Ephraim and Judah? Ephraim and Judah were two of the twelve sons of Jacob (who was later renamed Israel), and the fathers of two of the tribes of Israel. In Hosea’s time, the kingdom of Israel had split into the northern kingdom, called Israel, and the southern kingdom, called Judah. Hosea uses the name Ephraim to represent the whole northern kingdom, because it was the most prominent tribe. A morning cloud and dew are there in the morning, but are quickly gone as the day heats up. Likewise, the Israelite’s love for God was not steadfast, as God’s love for them was permanent. They quickly forgot Him—forgot all that He was and all He had done for them—and they followed after the desires of their own sinful hearts. The word “therefore” in verse 5 indicates that what follows is a result of what came before. Because the Israelite’s love was fickle, they were judged by the words of the prophets. Many years earlier, God established the sacrificial system as a way for the Israelites to temporarily atone for their sins and to worship God. They thought that keeping these sacrifices pleased God; that it was what He desired from them. They were partially right—God is pleased with obedience. But He is most concerned with the obedience of our hearts as we choose to love Him and love others because of His love for us. Verse 6 tells us that empty rituals are not what He desires. He desires hearts that love Him and know Him. Therefore, Ephraim and Judah would be judged. Ephraim and Judah represented the whole nation of Israel, a people whom God had chosen and set apart to worship Him, yet they were not faithful to God. Likewise, we as Christians have been chosen and set apart as God’s people (1 Peter 2:9). But we have a weapon in the fight that ancient Israel did not have—the power of the Holy Spirit dwelling in each and every believer. On our own, we simply cannot love God, we are too sin-filled. BUT! By the gift of the Holy Spirit, we are filled with the powerful God-ability to love Him and others! Thank God for this incredible gift! 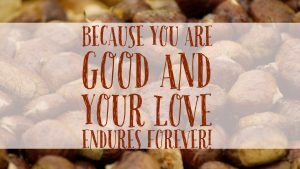 The Israelites’ love for God, though sincere at times, was not faithful or consistent. They so quickly forgot Him and His faithfulness to them. It is easy for us, too, to forget God, as we are so distracted by our busy lives. 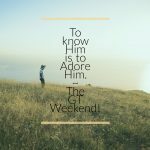 What safeguards and disciplines can I set up to remind myself of God’s love for me, so that my love for Him does not run cold? True believers can expect discipline from God when we go astray. Hebrews 12:6 says “For the Lord disciplines the one he loves, and chastises every son whom he loves.” Discipline and judgment are different, however. Discipline is for God’s children, and has the goal of restoration. Judgment is punishment—it is what justice for sin requires. If you are a true believer, your sin has been paid for by Jesus’ death on the cross, and you no longer have to fear the judgment of God. Praise God! The heart of these verses is summed up in this: God desires our hearts to love Him and know Him, much more than He desires empty rituals. Lord, give me a heart that loves You! You are the faithful God, help me to delight in You, to remember Your faithfulness, and to love You always, when I am tempted to forget You.